The Crystal Dish: Saturday Mornings are for..... 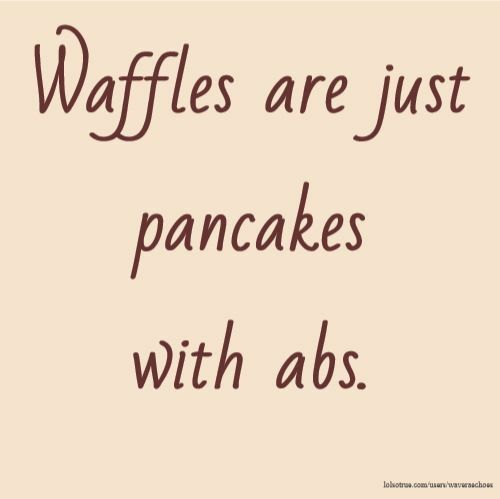 WAFFLES!!!! So for Waffles... Waffles are always so much fun to make. 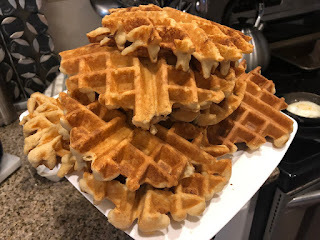 I have definitely been creative with waffles for my kids, from the traditional Belgian Waffles, to even Pizza Waffles... yes, you heard me right! I have made freaking Pizza Waffles! Those were actually so much fun to make! I had my SIL, bestie and her hubby over for dinner and we decided to do a dinner waffle bar of pizza waffles with Marinara dipping sauce... We got to build our own and we had a crazy amount of toppings. It was so much fun! I may have to try it again and post a recipe here because I think we made them and ate them so fast that none of us even got pictures of them!!! For Shame I tell ya!!!! 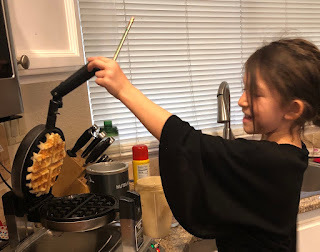 Well, this morning, I wanted to make a waffle that was good and healthier also for the kids and Jack since we're trying to eat better, so I was determined to come up with something and the thing I came up with was freaking amazing. The kids loved them and I don't think we even had any leftovers!!!! Preheat Waffle Iron and adjust temperature to preferred doneness. While the waffle iron is warming, place all ingredients, except butter into a high powered blender or food processor and blend on high until all ingredients are incorporated. Add butter and blend again a few more seconds. Use cooking spray to lightly grease waffle iron to prevent sticking and place about 1/3 - 1/2 cup of batter to waffle iron and cook until it's browned to your preferred doneness. These waffles are perfect and serve warm topped with your favorite syrup. We love our sugar free maple syrup.